Most of us don’t remember being a baby, or can you remember your first thought? The first time you held your head up? The first time you fell down when attempting to walk? Unless your parents took pictures or have a video of these first milestones of success it is difficult to remember. Memory is not the problem because more than likely you can lift your head, speak and even went from walking to running, skipping, jumping and so on. Do you think that your first step or your first sound or word was perfect? I’m sure your first step wasn’t a spectacular spot light on the catwalk strutting your stuff down the runway. Instead it might have looked like you were on a tightrope high above the circus arena, struggling with your balance and holding onto the nearest table that you pulled yourself up on. You may have even missed the object (table) you were holding on and fell on your bottom or did a face plant to the ground. How many tries do you think before you actually started walking? Do you think after a while of failing at walking your parents said okay, you’ve tried, enough of that, your just not cut out for walking. No your parents kept allowing you to fail over and over until you took your first step. They may have even held your hand and walked you out to the middle of the floor and let go until you became successful on your own. Honestly, do you see a parent out in public walking in front of their older child holding their hand and saying come on son/daughter lets go you can do it, you can walk on your own? Unless they have special needs more than likely, you don’t. As a parent they want their child to learn even if they fail, they encourage them to try again until they learn to walk, talk or take care of their needs. They didn’t hold their hand and become over protective of them, preventing them from learning as a child. It was through the allowing of failing and the determination to get back up and try again where we ALL learn. Thank goodness your parents learned early to let go, so you could learn to walk. Yes it sounds crazy and even ludicrous to some. But honestly what happened to that fearless parenting style of just letting go and let them learn how to do it on their own? Parenting has become smothering and overly protective, who many are having a hard time with letting go and letting them fail. Some parents have become more like maids or bodyguards protecting and doing whatever their child asks. In some homes the child leads and controls the household and even the parents. Parents do this because they might believe that if their child fails on their time, they will be judged. They might also want to protect their child from their personal past pains, not knowing that the parent learned valuable lessons FROM their pain. When having a step family we incur a lot of guilt where we believe we need to over protect, helicopter children and keep them from pain. Pain is the symptom that teaches the child and us to not numb it but to be brave enough to go within for the answers we search for. 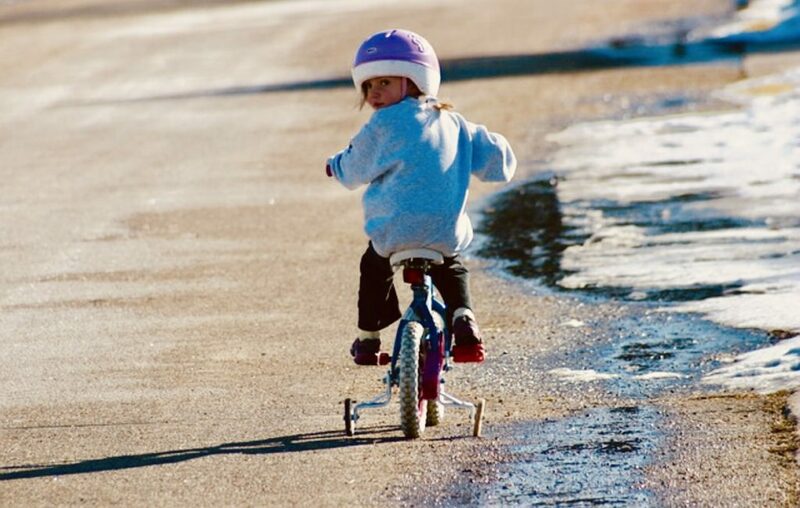 Theory goes that in order to learn how to ride a bike you first start with training wheels, right? Training wheels help children grow accustomed to sitting on a bike and using their legs to pedal, gaining strength in their legs and coordination, but this won’t help them learn to balance the bike on their own at least not at the beginning. The two training wheels represent the parents (or two representatives of the child). The child is on the seat riding, understanding and developing their beliefs of life and their world. The child is gaining understanding of who to trust, who will be there and how to handle it if there were only one parent helping to balance their life. It is best to have both training wheels to equal out the training process, but life happens and one of the parent needs to take more on them to help the child grow without feeling slighted or becoming a victim. It will be a challenge leaning on one side only, but this is where the parent can lean in to others for help without feeling like they are a burden. When the child has mastered the peddling and steering, now comes the tough part of parenting, when the basics of parenting is tested. What you as a parent has modeled in the past will come to light in how the child filters and practices what they have been taught to fit their character. The child’s pain or pleasure will drive them and as parents we need to trust this process, even if they fall and hurt themselves. The test that comes for the parent is taking the training wheels off, yes it will be different, maybe even a challenge for the child. It is the way we react to the situation of change that will help mold the child’s acceptance and allowance of falling and getting back up. When the training wheels come off that is when the parent has to let go of the needed support. Some parents may try to get side by side or partially in front of the child, holding the steering wheel and back of the seat throwing the child off balance. It’s best to stand behind the child and hold the back of the seat. Once they get going with momentum, “LET GO!” They may wobble and fall, but they will get up. The hardest gift for a parent to learn to give a child is the gift of failure. Casey and Yamile McBride, founders of McBride SOMOS Consulting. SOMOS means WE ARE. WE ARE whole, SOMOS love, WE ARE united, SOMOS capable of breaking patterns that does not suit us, nor our children. WE choose to create our own reality. If you are ready to be at peace regardless of what situation is going on around you don’t hesitate to book a breakthrough session at https://calendly.com/mcbride here or send us a private message.